I used to buy magnetic paint, but I wasn’t very happy with its strength, consistency and color, so Nick Vermeer and I decided to make our own. More often than not, things turn out to be more complicated than they appear, but in this case it was the other way around! 1) The magnetite powder is really fine so wear a dust mask and goggles. 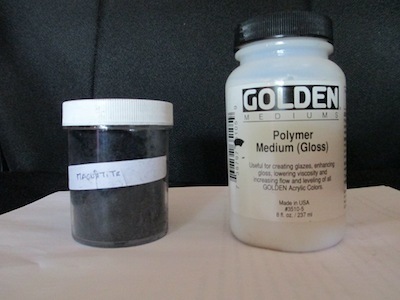 2) Mix 2 parts acrylic medium with 1 part magnetite powder by volume (we use measuring spoons). 3) Stir very well and get rid of all the clumps. You can do this by hand or use a vortex mixer (Cathal Garvey shows how to make your own on this video). 4) Apply 2 or 3 coats of the mix, depending on how strong you want it to be. On the video above I used 3 thin coats. Once it’s dry you can paint over it with regular paint or cover it with some thin material like paper. You can also try other solutions, it’ll work with almost anything, though the proportions will vary depending on the consistency of the medium. One approach is to start with the amount of magnetite powder you want to use and add the medium to it little by little until it has the desired consistency.